It’s the most wonderful time of the year, with much mistletoeing and parties for hosting. 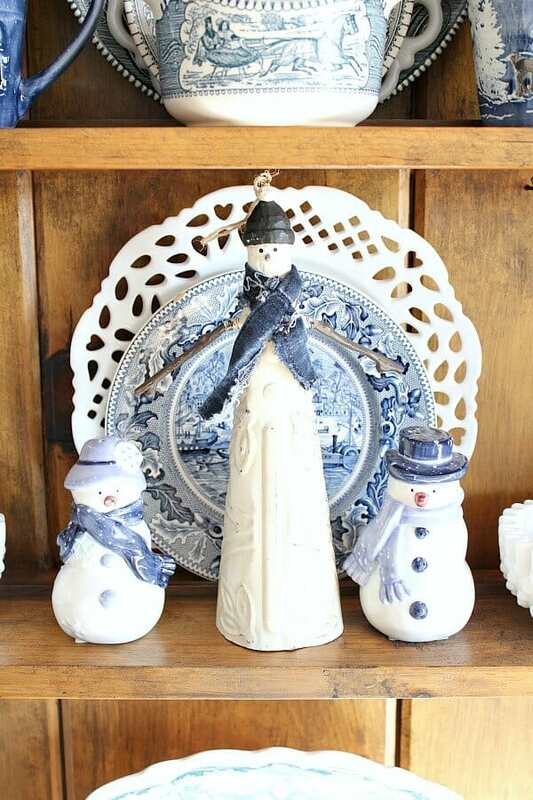 How do you decorate your table for the season? Formal and elegant? Or are you like me – buffet style, make yourself at home while creating a space that will allow the conversation to linger. 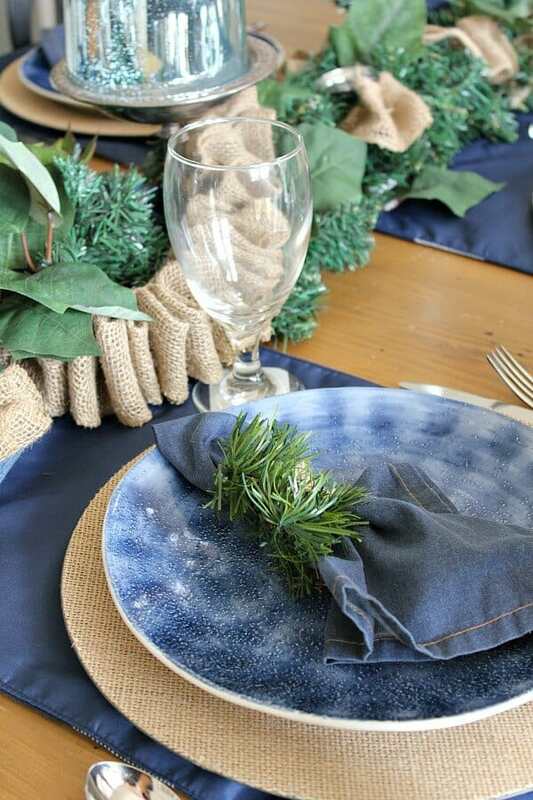 That’s my hope for this Denim and Burlap Christmas Tablescape this year. Affiliate links are provided for your convenience. Read my full disclosure here. 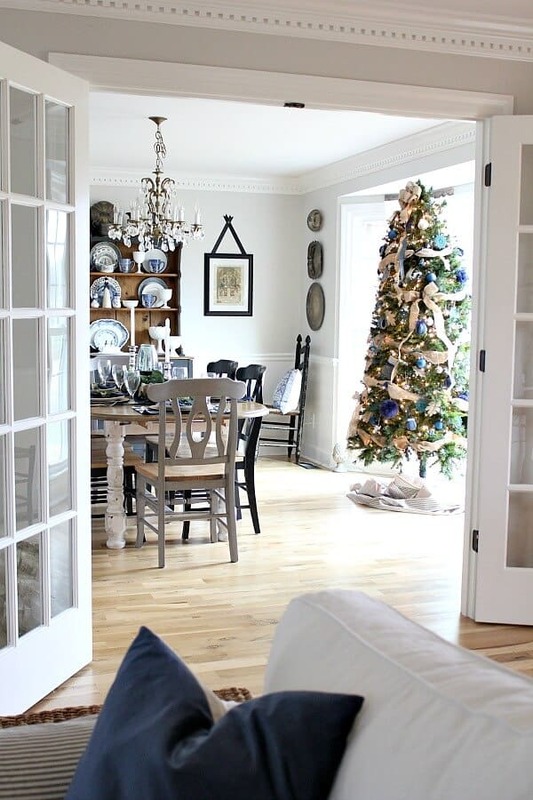 Kendra from Joy in Our Home has gathered together some amazing bloggers to share their Holiday rooms this year and I’m so excited to be able to participate. If you’re popping in from Celebrate and Decorate, welcome to my home! Chloe has such a gift with tablescapes and I love the traditional styling she showcased today, don’t you? I hope you enjoy this cozy and casual tablescape! The perfect pair of blue jeans. Broken in. Fits just right – there’s nothing cozier to me. I wanted to invoke that feeling while sitting at the table this Christmas. Just a spot to kick back, relax, and refill your plates as we sit and laugh and share special moments. That’s what I want this season. Here’s how I hope my table reflects that sentiment. It all started with these denim napkins from Walmart. That gold piping made it look so rustic and I loved how soft they were. 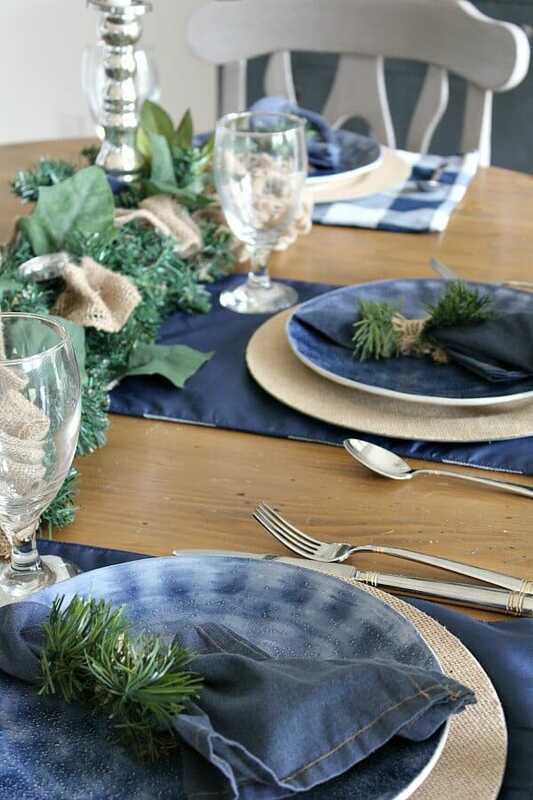 I paired with with these blue pottery dishes sitting on top of some burlap chargers. 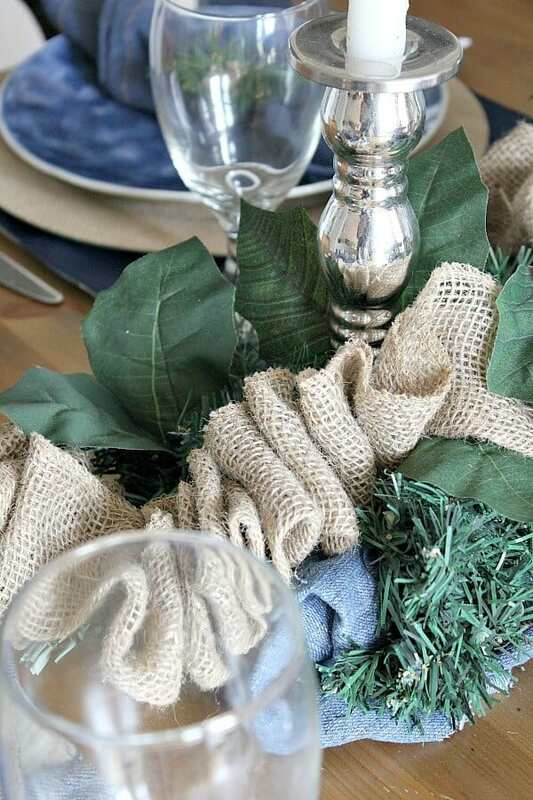 For the centerpiece, I created a custom arrangement using a mixture of greenery, burlap, denim and mercury glass. Additionally, I tucked leaves here and there from greenery stems I had on hand. So, this is relatively simple and hopefully cozy enough to allow the conversation to linger. I added minimal decor to my Painted hutch, since my Denim tree is in the bay window. A few holiday mugs and a little snowman arrangement adds a touch of holiday. I updated my tin snowman with a touch of denim as well to match the rest of my theme. So, next on this tour of Christmas tablescapes is Jenn and Vicki from 2 Bees in a Pod – you will love their Christmas Village tablescape! 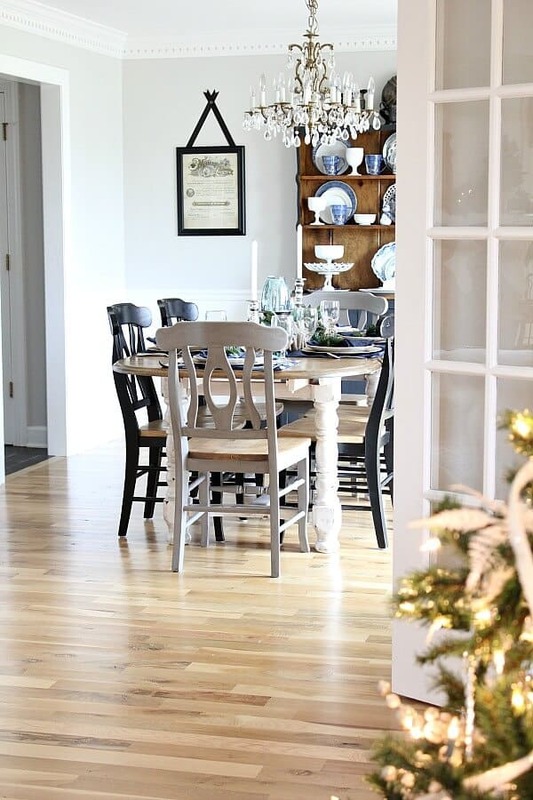 And for more inspiration – simply visit each blogger below where they share their Mantels, Vignettes, Recipes, and Porches – all brimming with loads of Christmas inspiration, of course! Love the pairing of the burlap and denim! 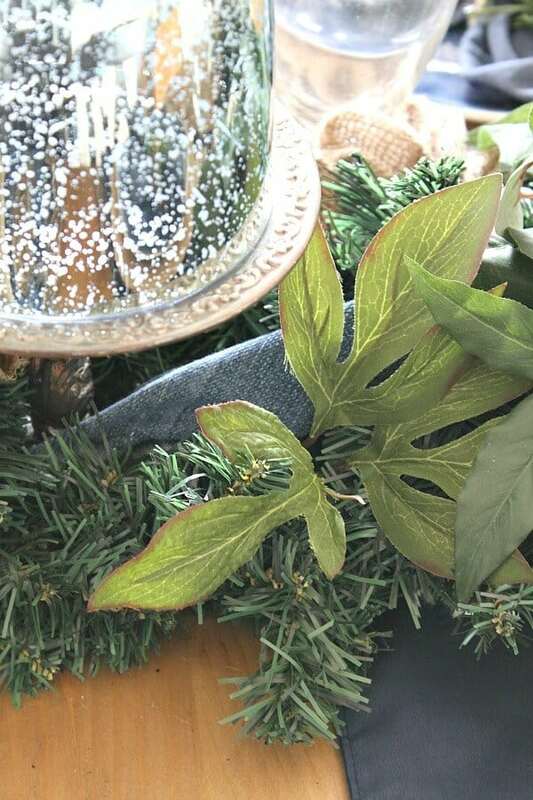 I never thought of decorating for the holidays with denim and it looks AMAZING! 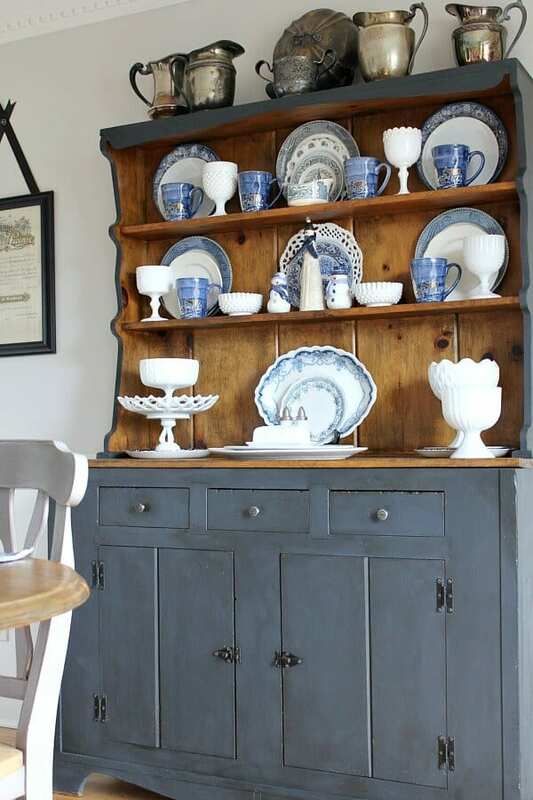 And that hutch… So dreamy! Thank you so much for sharing! Jen – as usual, we love it all! You have taken denim to a whole new level! 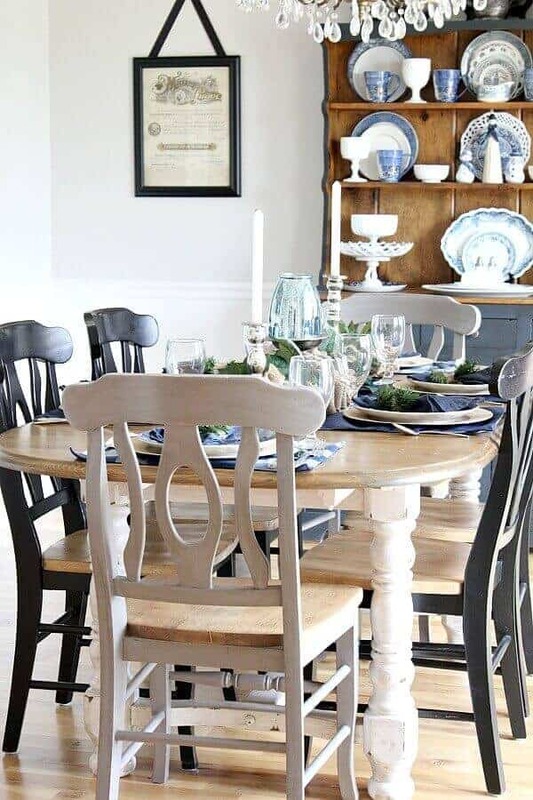 Your dinner guests will never want to leave this beautiful table setting.or gorgeous home. We wish you and your family a wonderful Christmas season! I LOVE this tablescape. It’s so relaxed and inviting! The combination of denim and burlap is perfect. Enjoy all those lingering conversations 🙂 Merry Christmas! You have done it again my friend! Gorgeous! The entire room is always so pretty! Have a very Merry Christmas~! This is so pretty Jen! I love how you’ve incorporated all of the Blue to last through the season! Simply gorgeous! Oh – you are the sweetest! Going out on a limb is risky, but I think it turned out ok! Oh Erin – you are so sweet! Thank you for your kind words! Thank you Lindsay – your comments always make me smile! Thanks CoCo – You are making me blush with all your sweet words. Thank you for making my day! 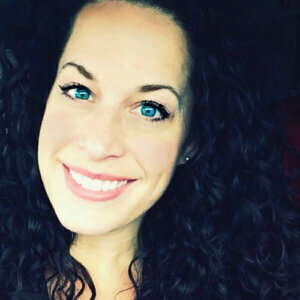 Thanks Christine – it was fun going out of the norm and enjoying my blue! Thank you Meg! Merry Christmas to you! Jen, this is really pretty! I love your dining furniture to begin with. The blue and white color combo is just gorgeous. I really love your combination of burlap and denim – never really thought of that before but they are a “natural” together! 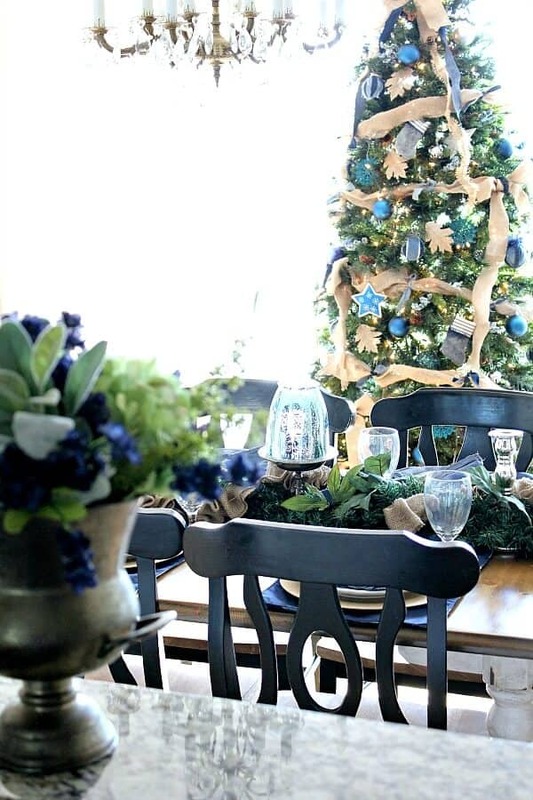 You’ve coordinated everything in the room perfectly – even a tree decked out in burlap and denim! 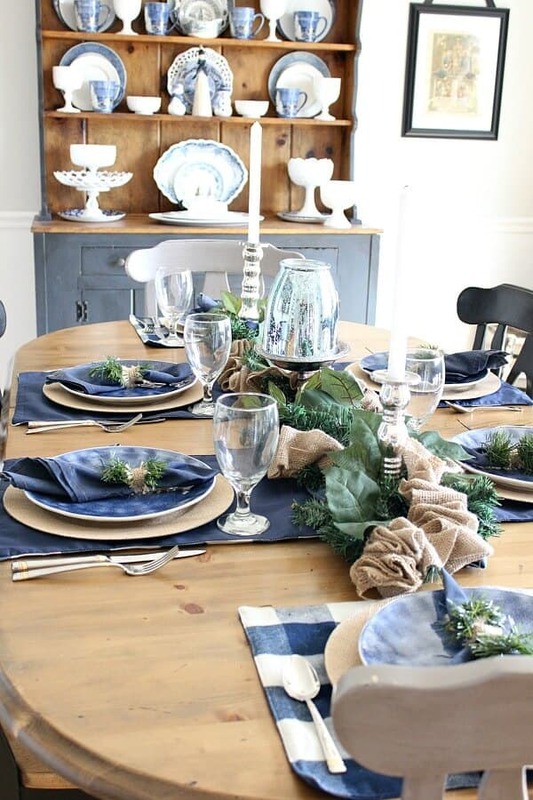 Those burlap chargers are fantastic and the blue pottery plates look lovely on them. 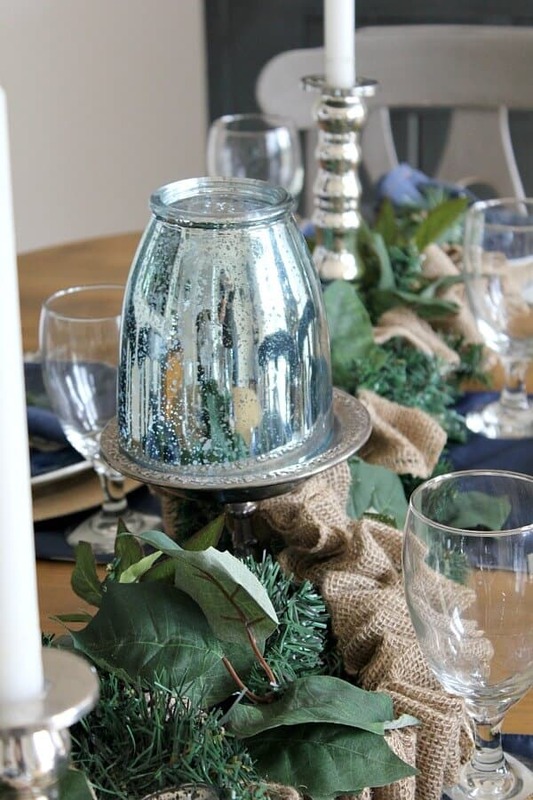 Your centerpiece is put together with just the right amount of greenery and the mercury glass adds a terrific bit of sparkle. I also love your light coloured hardwood floors! Really enjoyed my stop here on the Blog Hop! What a beautiful tablescape! I had to laugh when I saw what inspired you, because I saw those denim napkins (from The Pioneer Woman) at Walmart the other day! I picked up the polka dotted ones that she has and I was talking to another blogger friend and she had picked up the same polka dotted napkins as me the same day! I guess Pioneer Woman is owning it with her napkins she has designed! Ha! I just love everything, it all blends together so well! Such a pretty table and it even matches your gorgeous tree!!! Your tablescape is beautiful! 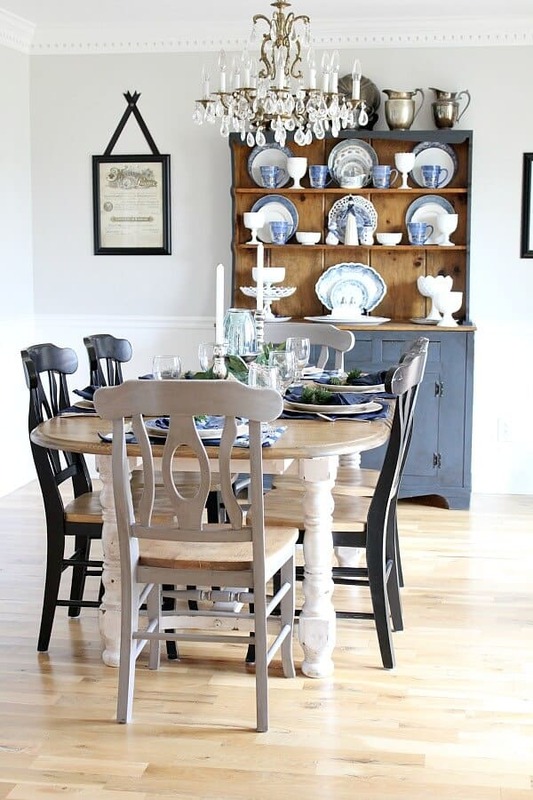 I’m swooning over your painted hutch, tables and chairs! I’m thinking of painting my oak ones! Lori – your sweet words brought a huge smile to my face this morning! Thank you for leaving me such nice comments! Carrie – great minds think alike! I eyed those polka dotted ones too! Thanks so much for all your sweet words! It means so much that you took the time to comment! 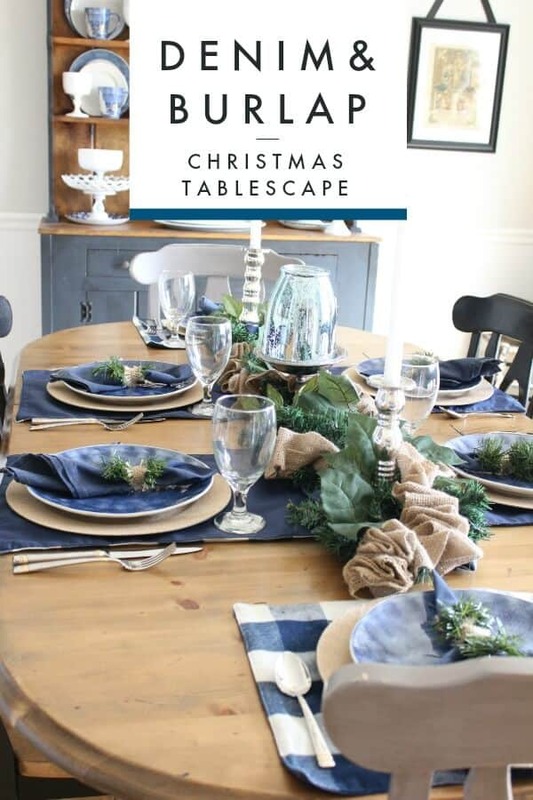 Thank you so much – what sweet words coming from ladies whose tablescapes inspire me! It means the world that you took the time to comment – happiest of holidays to you both! Jen!!! Your dining room and tablescape are just gorgeous!! I love your use of blue and the denim is so unique! Beautiful job!! Thank you Bree! It was so wonderful being on this tour with you. Merriest of Christmases to you and your family! Sp pretty, Jen! I love the casual but elegant combo of the denim and burlap! Love the blue for the holidays! It is so different. And that hutch is gorgeous! This is so pretty! Two of my favorite things- denim and burlap, so I was excited to see right away!! 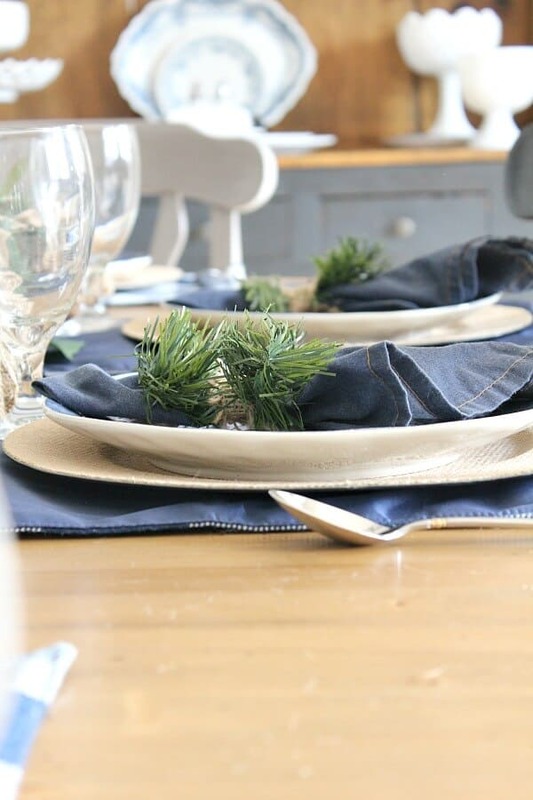 I love how you did the greenery around the napkins and how your tree coordinates! Such a beautiful space and table! I enjoyed being on this hop with you! Jen, your colors are so gorgeous and so perfectly you! Thank you Kristin! I hope you had a wonderful holiday!